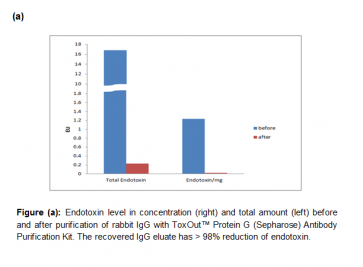 ToxOut™ Protein G (Sepharose) Antibody Purification Kit | K2505 | BioVision, Inc.
Ready-to-use kit for endotoxin-free IgG purification and immunoprecipitation. 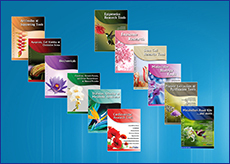 Antibody purification for endotoxin-free samples. Protein G beads are widely used for IgG purification for their ability to bind selectively immunoglobulins. BioVision’s Protein G (Cat. No. 6510) is a genetically engineered protein containing three Ig-binding regions of native Protein G. The cell wall binding region, albumin binding region and other non-specific regions have been eliminated from the recombinant Protein G to ensure the maximum specific IgG binding. Protein G-Sepharose beads (Cat# M1301) for IgG purification contain covalently coupled recombinant Protein G to 6% cross-linked Sepharose beads, the most popular resin for protein purification. ToxOut™ Protein G (Sepharose) Antibody Purification Kit is a ready-to-use kit for endotoxin-free IgG purification and immunoprecipitation. 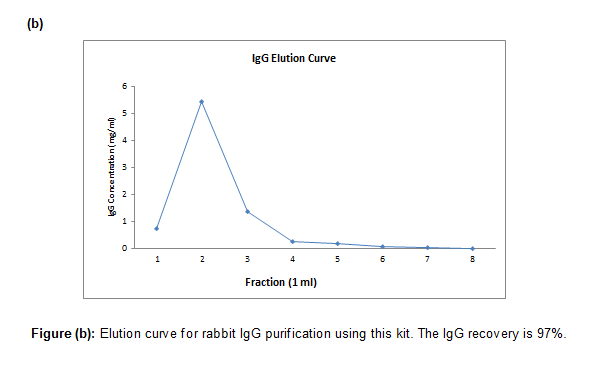 This kit can rapidly purify IgG from serum, ascites and cell culture media from various species such as human, mouse, rat, goat and rabbit.